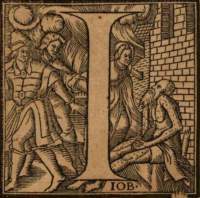 The series from The Old Testament starts with the Fall of Man. 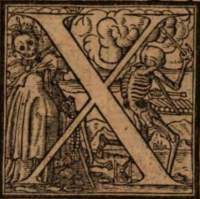 The dance starts with Bones of All Men. 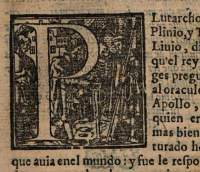 A very curious alphabet, which although not equalling Lützelberger's is of more than average execution, can be but little known to bibliographers, for as far as we have ascertained it only occurs in a few books published at Stella, in Spain. 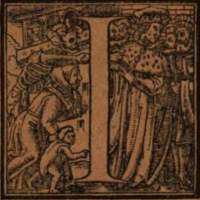 The scenes are selected from the Simulachres, and each letter is a complete little picture. 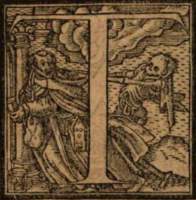 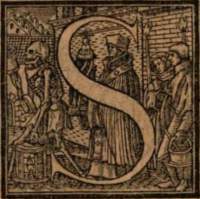 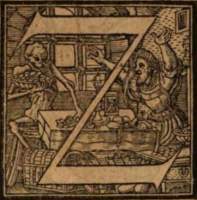 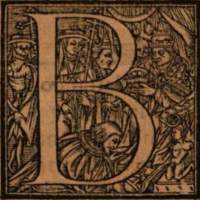 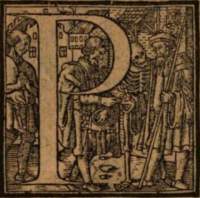 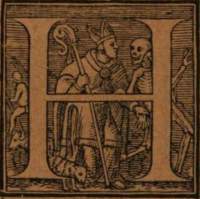 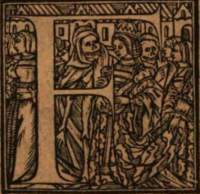 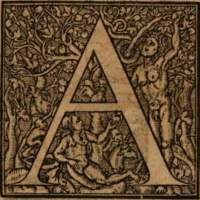 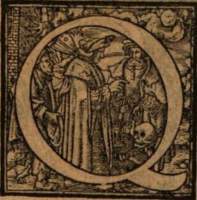 The alphabet […] is a copy not of Holbein's alphabet of Death, but of the little pictures that illustrate his Simulachres or faces historiées de la Mort. 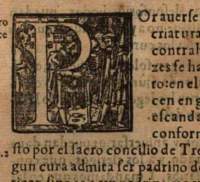 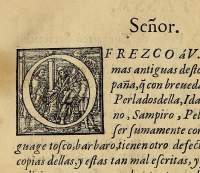 Some of them occur in a book entitled Series totiu historiae sacri Evangelii autore Petro Trurozqui Navarro (Stellae, Adrian Anverez, 1557), which contains also most of the letters of an alphabet copied from the Biblical series of Froshover of Zurich, mentioned in its place. 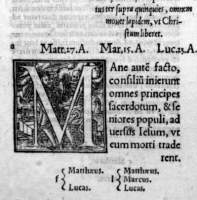 Another book without printer's name, but dated 1555, in which they occur, merits from us a more particular description, inasmuch as it consists almost entirely of initial letters. 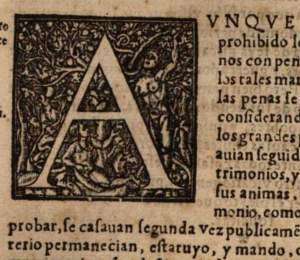 The title of this typographical curiosity is Libro Sotilissimo y provechoso para deprender a escrevir y contar el qual lleva la misma orden que lleva un maestro con su discipulo en que estan puestas las cinco reglas mas principales de guarismo y otras cosas sotiles y prouechosas. 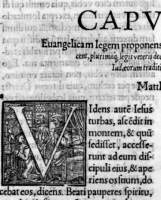 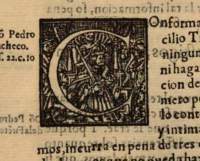 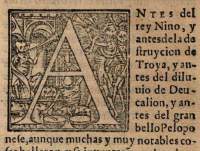 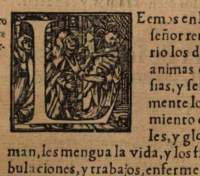 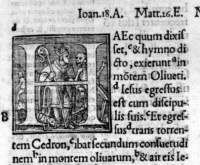 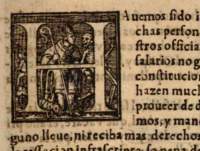 Each page of the little volume is surrounded by a woodcut border. 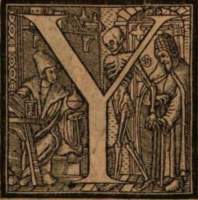 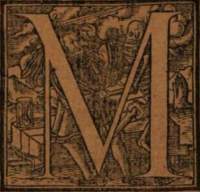 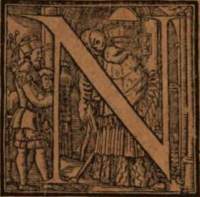 On the verso of the title, the notice to the reader begins with the M of the Dance of Death alphabet. 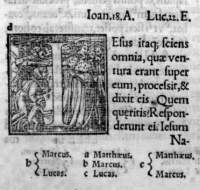 The two succeeding pages have little pictures of the saints. 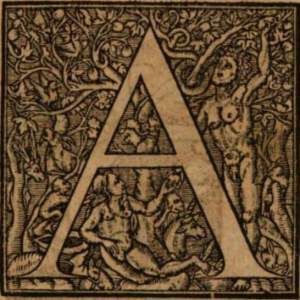 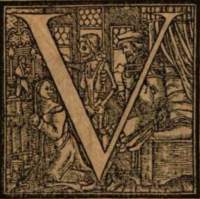 On the verso of the fourth page begins the same Biblical alphabet as in the other volume, the first letter, A, representing Eve and the tempter with the Tree of Knowledge, the alphabet, the letters of which are used as illustrative cuts and not as initials, being continued one letter per page with about five lines of text underneath; (B Abraham), C (Jacob), D (David), H (Absalom), and so on. 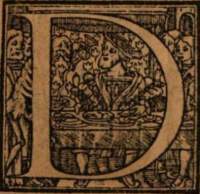 When the Biblical alphabet is finished, the Dance of Death letters take its place, two on a page with a cul de lampe underneath the border, but no text. 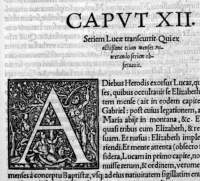 They are twenty-three in number, occupying twelve pages, the last being accompanied by the A (Eve and the Tree of Life) of the other series. 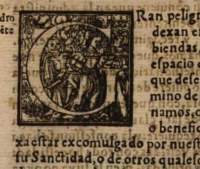 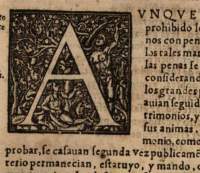 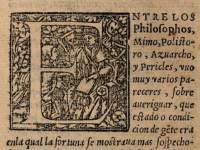 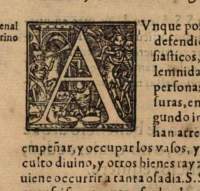 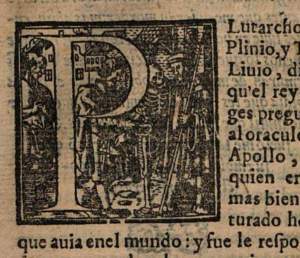 Libro llamado Auiso de priuados, y doctrima de cortesanos, 1579. 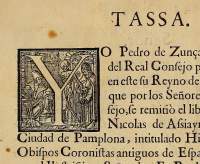 Constituciones Synodales del obispado de Pamplona, 1591. 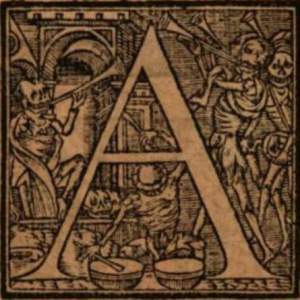 We are dealing with two series of the letters from A to Z. 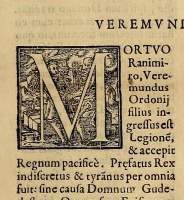 As always with Roman majuscules I/J and U/V are conflated, and since neither of these two series include any W, there are 23 images in each. 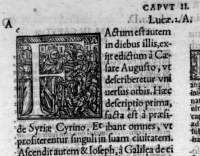 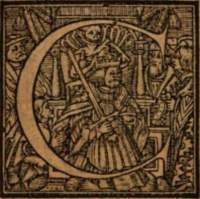 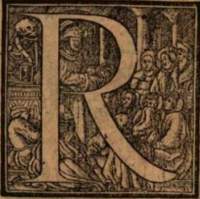 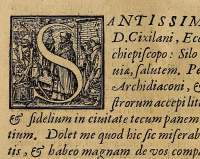 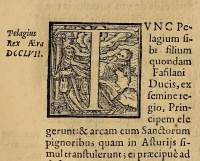 The woodcuts were published separately in a book named "Libro sotilissimo" in 1555. 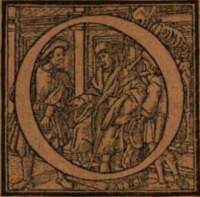 The first series features scenes from The Old Testament. 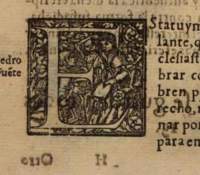 It starts with a copy of The Fall of Man by Holbein (picture in the top, left corner), but the rest of the scenes appear in a rather random sequence. 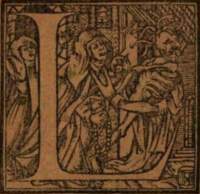 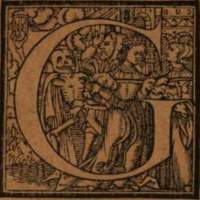 The second series copies Holbein's great dance of death and not his dance of death alphabet as one would have expected. 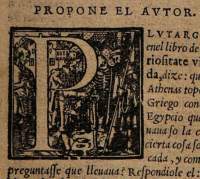 It starts with "The Bones of All Men" (picture in the top, right corner) and follows the sequence from Simulachres slavishly except that the astrologer doesn't appear, just as he didn't appear in the so-called printer's proofs. 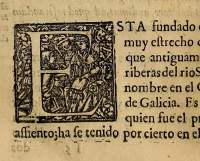 Jenkins states that these alphabets were only used in a few books published in Stella (Estella is a town in the former kingdom of Navarre in northern Spain). 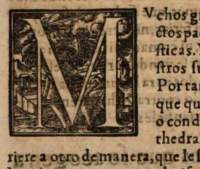 One might have assumed that these large initials would have been too dominating to be used for practical purposes, but Jenkins is wrong: Quite contrary to what one should think, these large images were in fact used very diligently in books in Navarre in the 16th and 17th century. 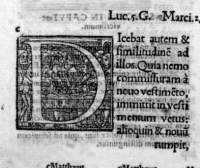 Without having performed an actual count I'll almost claim they were used even more than Holbein's original alphabet. 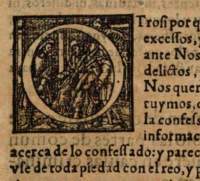 I include several examples below. 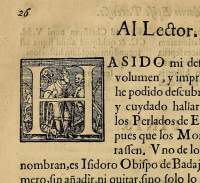 Libro sotilissimo y prouechoso para deprender a escreuir […]. 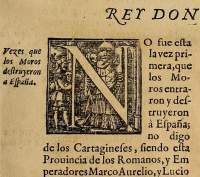 Constituciones Synodales del obispado de Pamplona. 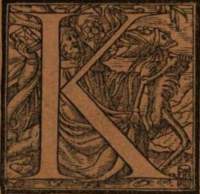 Example of a book that uses plenty of these initials. 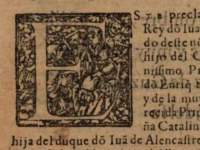 La danza de la muerte en los impresos navarros de los siglos XVI y XVII. 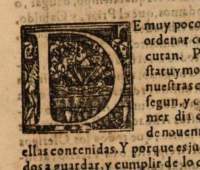 Article (in Spanish). 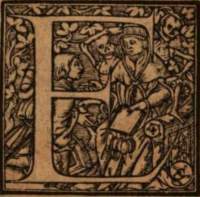 Includes a list of 42 printed books that employ these initials.